A piece of malware targeting Russian-speaking Android users abuses a person’s contact list to try and infect other devices, according to security vendor Eset. The malware uploads data to a domain that was registered about a week ago. Samsapo spreads by sending text messages from an infected device to other people in the victim’s contact list, a worm-like characteristic that has been used by other mobile malware programs. 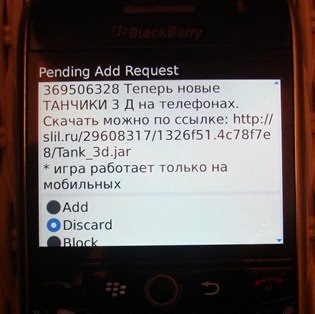 The text message says “Is this your photo?” in Russian and has a link to an Android application package (.APK) file containing a copy of Samsapo. “This technique wouldnt raise an eyebrow on Windows, but is rather novel on Android,” Lipovsky wrote. The APK file name makes it appear as a system utility: “com.android.tools.system v1.0.” The program doesn’t have a graphical user interface nor an icon in the application drawer, Lipovsky wrote. Android will warn users when downloading applications from unknown sources. Google scans its Play store for malicious applications, which reduces the chance a user will download a malicious one. Security experts generally recommend not downloading Android applications from third-party websites, as even legitimate looking applications may have been maliciously modified. Also, applications that ask for permissions such as reading and writing text messages should be viewed with caution.